What is clear is that finding jobs in India demands a change in the way we do business. Let us be clear, the formal industrial sector has never provided employment in the country. With greater mechanisation in the years to come, its contribution towards generating employment is bound to decline further. The service economies -- outsourcing included -- will grow but cannot really absorb jobseekers in a country the size of India. The key to generating employment lies in building productive and sustainable livelihoods-based on natural resources. The potential is enormous -- from planting trees for pulp to rearing animals for dairy farming to rearing worms for silk and growing medicinal plants for pharmaceutical industries. It is critical that employment and enterprise go beyond the conventional economic opportunities. It is here that the challenge of sustainable resource utilisation becomes imperative. A study by the Centre for Science and Environment shows trees planted for the pulp and paper sector in India can provide a fascinating model of growth with jobs. Roughly 1.1 million ha are required to supply the required 5 million tonnes of raw material to the industry currently. This in turn could provide employment to over 0.55 million farming families in growing wood and harvesting wood in a sustainable manner. But this means government policy will have to promote use of wood grown by farmers on private land or by communities on degraded forestland. It also means the government cannot allow large-scale concessions over forestland to industry, as it would distort the market for community-grown wood. In each of these employment options, tough but strategic policy decisions will need to be taken. Let us be clear. Governments will need much more than paper programmes and political platitudes. All this will also demand that governments reorient their environmental policies from conservation to sustainable utilisation. For instance, several legal constraints prohibit people from growing, transporting and marketing trees. These legal provisions are designed to protect forests, but they restrict people from regenerating forests. 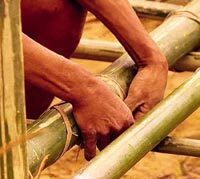 For instance, the Indian government has identified bamboo cultivation and its products as an important contributor to employment. But the law in most parts of the country does not allow people to grow and market bamboo. Poverty eradication will demand innovation in managing the competing and complex needs of conservation and employment generation. It is not enough to launch a mission for bamboo, without working through this legal framework and securing the rights of people to grow and harvest the crop. It will also mean that governments will have to take the fight to international trade forums. They will have to fight to secure a place for the small producers to compete in international trade. They will have to argue that poor farmers compete in a world of overproduction and heavily subsidised products. That as a result they over-work the land, over-fertilise it, over-use pesticides -- all to increase production. They devalue the land and their labour to compete on unfair terms of trade. In other words, global markets do not allow them to capture the ecological costs of what they produce. Therefore, sustainable agriculture is not possible, without first removing distorting subsidies in the North. What we need now is a new set of policy measures to facilitate use of ecology for economy. But when government is the biggest obstacle, who will pave the way for such measures?